from the crafty folks at etsy! 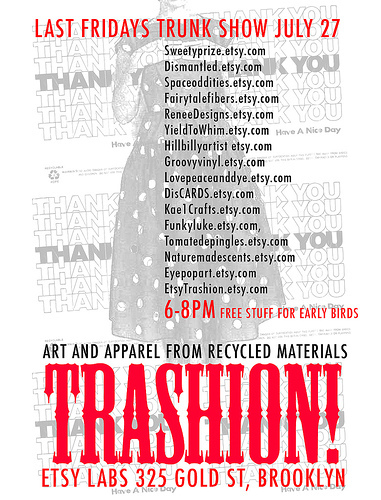 What is Trashion? Well, as you might guess, it’s fashion, accessories, art, and crafts made from trash and upcycled and recycled materials. You can check out the philosophy and some of the work of these artists here. What are Last Fridays Trunk Shows? Glad you asked! They’re parties with music, drinks, fun people to meet and talk to, and awesome goods to browse and buy- basically a great way to start your Friday night. Please rsvp if you wanna come. See ya soon! I was wondering if this event happens the last friday of every month? Also, what do you need to do to sell at this event? Is there a selection process? Does it cost money? I’m a Minneapolis crafter but my husband and I are moving to Brooklyn in April and I’m trying to find places to sell at out there. i would recommend contacting the nice folks at etsy for more info on their events. good luck with the move, i’m sure you will find lots of great spots to sell here in lovely brooklyn!